Limes are always a must have in my kitchen. I was lucky to get a great value on limes recently and so after I took advantage of my savings I had to figure out what to do with all these limes. This Lime Cooler came to mind quickly. I decided to jazz it up with a Ginger-Mint Simple Syrup. This drink is refreshing and really tickles your taste-buds. You can make it as tart or sweet as you want by making more or less of the simple syrup. I made it more on the tart end because I love a good "pucker" to my lemon or lime drinks. Notes: I added one batch of the simple syrup for a sweet/tart flavored cooler. You can add more simple syrup to tailor it to your taste. Make the Ginger-Mint Simple Syrup and allow it to cool. 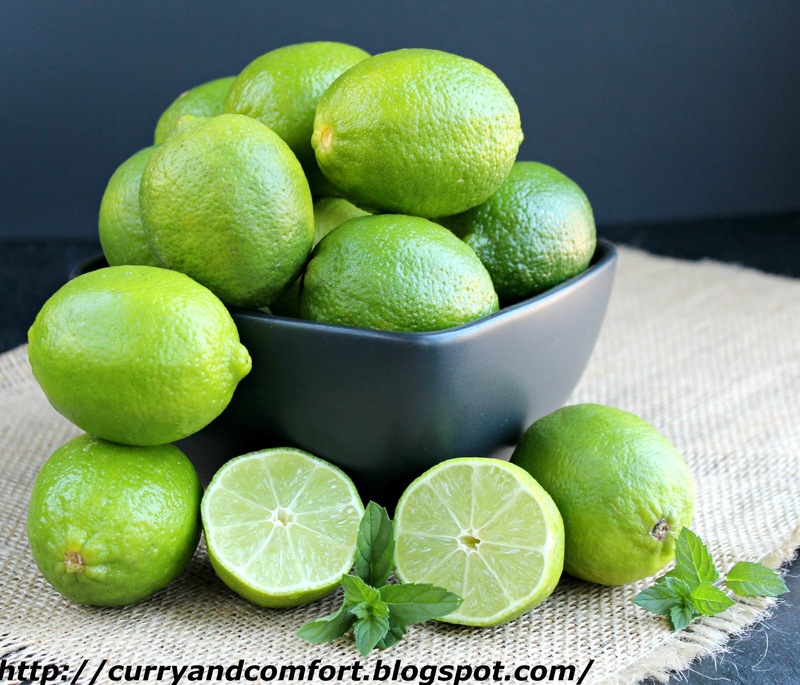 Squeeze lime juice. Add water, lime juice and as much simple syrup as you wish to make sweet. Serve cold or over ice. Ramona,yes,,, is the time for this refreshing drinks,I love the ginger mints simple syrup recipe,thanks for sharing and have a great day !! 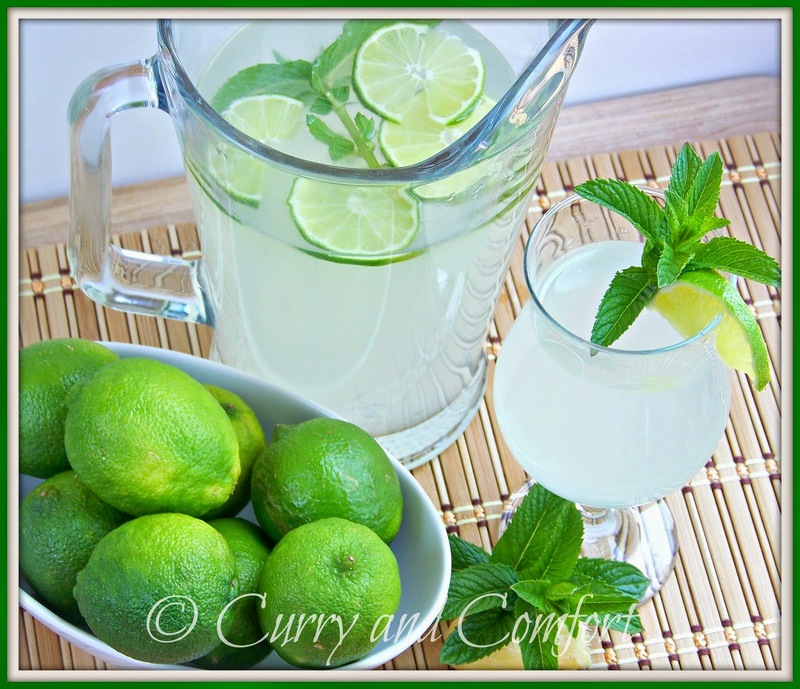 I love lime and mint together, thanks for sharing this....will be making a batch of this soon! Omg, wish to have a glass of this refreshing drink rite now, incredible clicks. love it - made a similar drink recently - made a drink similar to this yesterday with lime, mint & mango - ginger would have been a nice addition! Lime and ginger?? I can't wait to try this one. Looks delicious. and healthy! Everytime I pass up limes at the store I come home and see a fabulous recipe that uses them. Your cooler will definetely hit the spot on a lazy hazy day. I will have to make a double batch I'm sure. Ohhh this is a great idea! I can see myself sipping on a glass or 2 enjoying the summer. If it gets really hot, I think I would freeze it a bit I have something like a slush puppy. Can’t wait to give it a try! Hum - I keep a bottle of ginger simple syrup in the fridge at all times. Looks like next time I'll be adding some mint since I do have a ton in the garden! Thanks!!!!!!!!!!!!!! OH... HELLO! You know this is right up my alley. I am making this 100% for sure. I will have to make mine sugar free, because we are all on diets. Thank you! Love all these flavors! Ramona would you mind if I adapt this recipe and link back? It would not be for a few weeks, but with my psycho lime tree... This one is a winner! I have to do sugar free and will probably make mine a spiked cocktail. I would use my own photos and verbage and of course link back and give you credit. Marla-pup... you can always substitute splenda or stevia for white sugar. They are both diabetic friendly. Instead of making the simple syrup by boiling the sugar substitute... just boil the ginger and then add the sugar substitute to dissolved one you turn off the stove. I love refreshing drinks like this and I am crazy about squeezing lime juice in my water right now! This would be perfect! I am much more of a plain drinker. Water and milk is about all I consume. I love the pretty pictures though. I even planted some mint this year just in case I branch out. Lovely! I always used to cook with limes, but they are sooooo expensive here so now they are kind of a rare treat. This sounds so good and refreshing! Great flavors! Your simple syrup sounds incredible...I'm ready to start sipping! I have so much mint and was wondering what to do with it. This is a winner. My husband loves drinks like this...particular lime flavored ones. This looks so delicious and perfectly refreshing for beating the Texas heat! 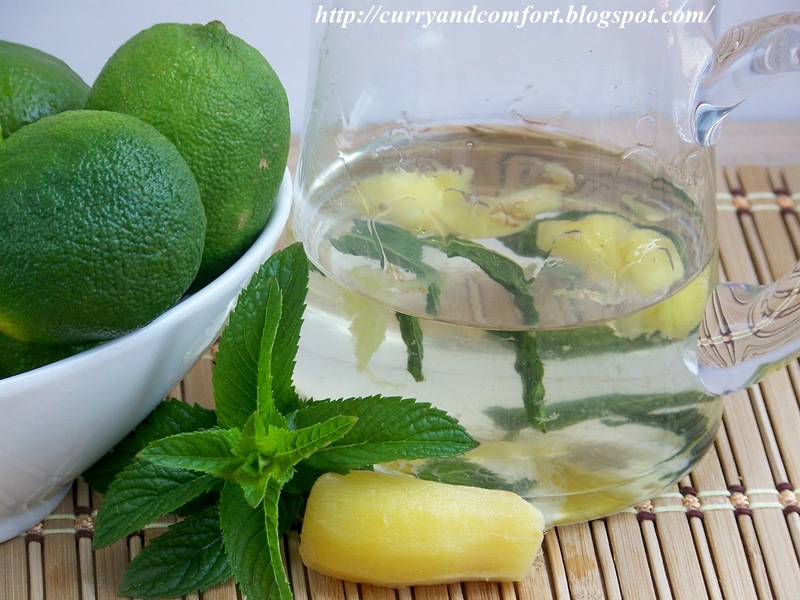 I love the flavors and all the fresh lime and ginger! Great summer drink. This cooler sounds fabulous, Ramona! I love the all flavors! Ooh, I could use one already and it's only 8 AM! What a lovely, refreshing drink! PS...YES, I hope we can meet up some day at a blogger convention! That would be a blast!!! This sounds so refreshing especially with the lovely heat wave we are having. Oh goody goody - I just bought a bag of limes from Costco. 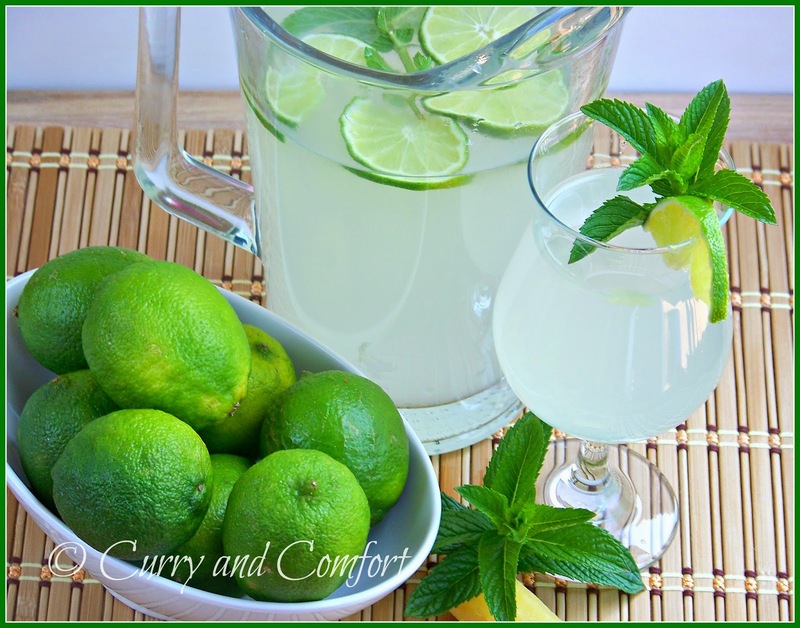 Love this limeade with the ginger mint syrup! what a lovely pictures! This is the ultimate summer refresher!